In startup circles, it’s trendy to talk about how entrepreneurs are leaving high-tax, high cost-of-living metros for cheaper locales. While Silicon Valley remains ground central for hobnobbing with investors, the common wisdom goes, early-stage funding stretches much further elsewhere. As memes go, it makes sense. But does the data bear this out? Is Texas turning into the new California? Is Salt Lake City edging out Seattle? Are the largest U.S. startup hubs losing their edge in luring promising early-stage startups? 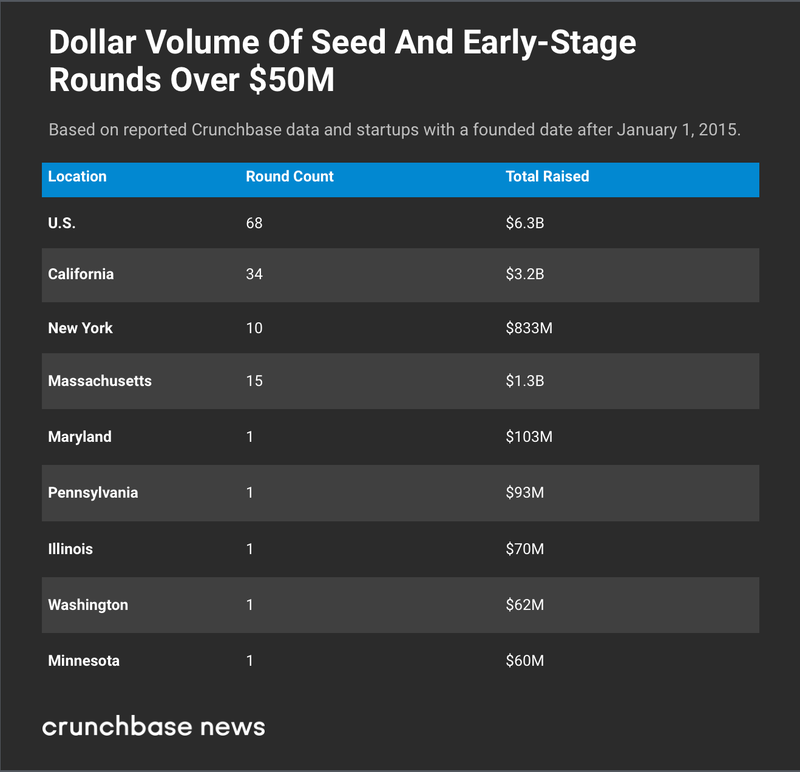 In a somewhat eccentric data crunch, Crunchbase News set out to see the extent to which certain regions are gaining in early-stage and seed activity. We also attempted to see whether any of the big, established startup ecosystems are showing obvious signs of decline. To lay out our case, we looked at four metrics. 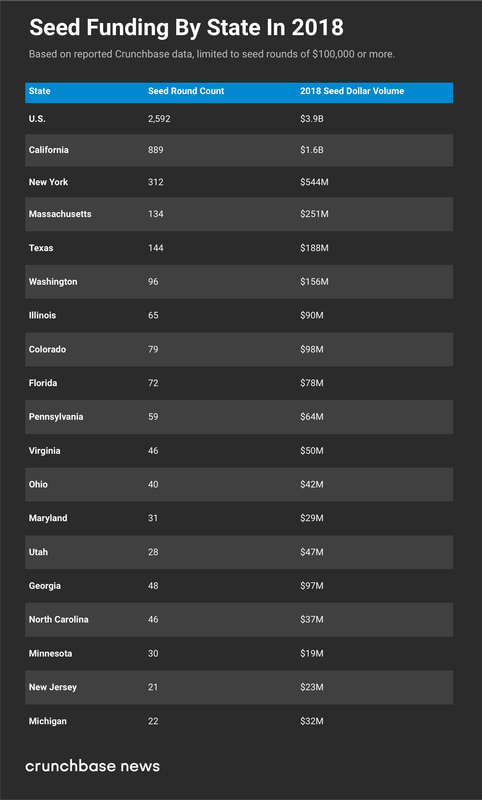 First, we measured total reported annual seed funding and round counts by state for the 18 largest venture capital ecosystems. Next, we looked at seed through early-stage investment and deal counts across three size ranges. They include moderately sized rounds of $1 million to $5 million, larger ones of more than $5 million and less than $50 million and really big early-stage investments of $50 million and up. The idea with the size-range data sets was to see how tech hubs stack up in terms of launching well-funded startups. It’s one thing to have a lot of seed-funded startups. It’s quite another to see them go on to close follow-on rounds in the millions or tens of millions. We also wanted to see whether the top startup hubs are retaining their dominance in launching companies that go on to secure the biggest early-stage rounds. Top hubs hold pretty steady. The largest venture ecosystems aren’t showing signs of significant contraction this past year at seed and early-stage. Across the metrics we measured, the three largest (California, New York and Massachusetts) are hanging on to similar shares of funding as prior years. Utah and Pennsylvania outperforms. Two states stood out in terms of posting gains across several seed and early-stage funding metrics: Pennsylvania and Utah. Pennsylvania benefited from heightened investment in biotech, transportation and robotics, areas in which it has large talent pools. Utah, meanwhile, prevailed in enterprise software. Texas sees big gains in larger rounds. Texas didn’t see an annual rise in total reported seed funding, moderate-size deals or really big early rounds. However, the state was red-hot in producing startups that secured rounds of more than $5 million and less than $50 million. Below, we’ll flesh out these findings, as well as take a look at the overall breakdown of seed and early-stage funding. As you can see, the top six states take in the lion’s share of seed funding, with California the leader of the pack by several multiples. 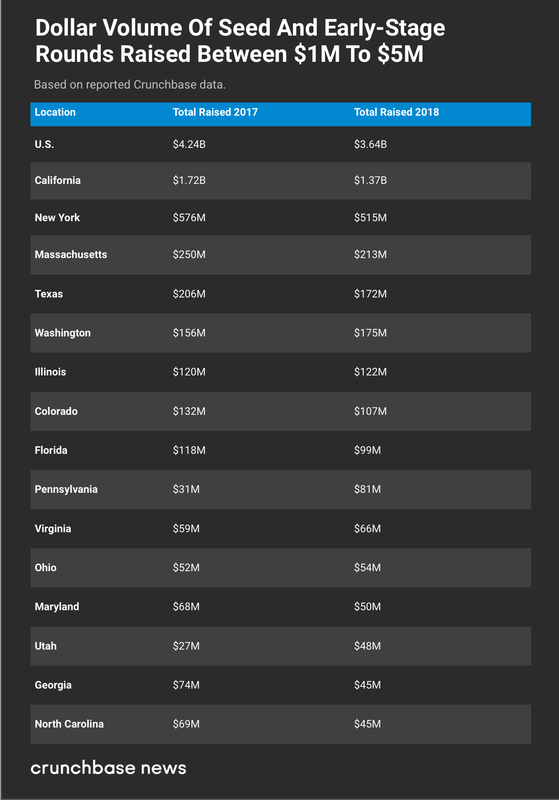 Next, let’s look at how the top states rank by another metric: Moderately sized seed and early-stage rounds of between $1 million and $5 million. The reason we included this metric is because it includes very early-stage companies that have a lot of runway ahead, but have already attracted some serious investor interest. We also provided a year-over-year comparison, as it may be an early indicator of a state’s venture ecosystem gaining or losing traction. As you can see above, the top five states for venture investment didn’t see big gains or losses in their share of investment at the $1 million to $5 million round size. Where we did see big increases was in two aforementioned states: Pennsylvania and Utah. Another metric to gauge a tech hub’s momentum is its ability to produce startups that raise pretty big seed and early-stage rounds. For mid-sized tech hubs, we see a good amount of year-over-year fluctuation in share of total investment for this category. A single big round or two can really move the needle, so it’s probably wise not to make to much of a single year’s fluctuation. Texas, however, really is showing momentum: The Lone Star State is the largest tech ecosystem where we saw a really big year-over-year increase in rounds over $5 million and under $50 million. In 2018, Texas had 30 rounds in this category (see list), bringing in a total of $366 million. That’s up from just 13 funding rounds in the category bringing in $138 million in 2017. While we can’t point to clear-cut causes for the increase without deeper analysis, it’s apparent this is a bullish indicator for the Texan startup scene. Last, we looked at really big seed and early-stage rounds of $50 million and up for companies founded in the prior four years. This is a funding category that barely existed several years ago. However, giant early-stage rounds have really mushroomed in recent quarters with the emergence of super-sized venture funds like the SoftBank Vision Fund and a greater willingness among investors to throw hundreds of millions at nascent sectors like scooter sharing. The data indicates that really big early-stage rounds still primarily occur in the biggest startup hubs. The San Francisco Bay Area, New York and Boston were home to more than 85 percent of companies in the 2018 list for the category. No other state brought in more than one deal. In conclusion, we’d have to say that rumors of the slow death of California’s startup scene have been greatly exaggerated. 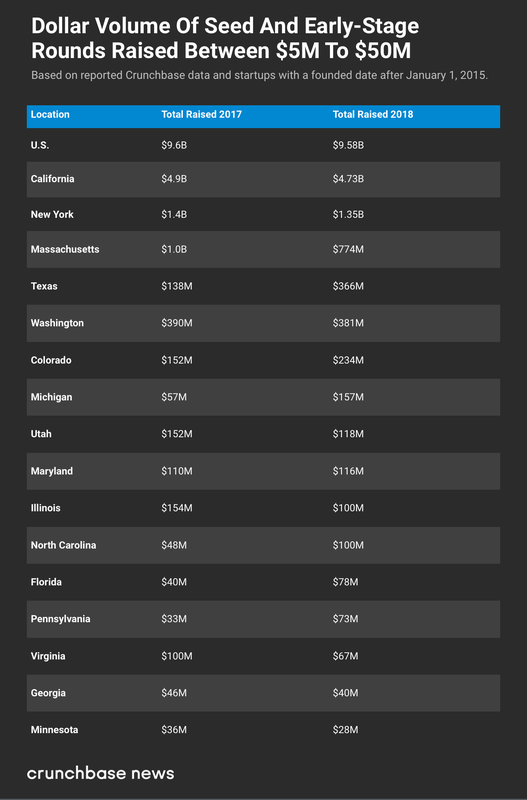 Although all three of the top states for startup funding are high-tax, high cost-of-living locales, they’re also continuing to hit high marks in launching entrepreneurial companies and raising capital for them to grow. Nonetheless, the data does reveal some apparent up-and-comers among startup hubs. Two that we notice are Pennsylvania and Utah. Pennsylvania outperforms: I grew up in the Philadelphia area, so naturally I’m pleased to see the state ranking deservedly higher across our seed and early-stage metrics. However, Philly can’t get all the credit for the rise. Pennsylvania has the good fortune of housing two startup hubs: Philly and Pittsburgh. Traditionally, Philadelphia has been a strong contender in biotech, with strength also in fintech, media and other sectors. Pittsburgh, as we’ve reported previously, is emerging as a hotbed for robotics, AI and transport. Between those metro hubs, Pennsylvania saw a big rise year-over-year in round counts across all the categories we tracked (except for $50-plus million rounds, which were tied with 2017). Investment totals were also up markedly. And don’t forget Utah: Utah has also been moving up in the ranks, delivering a particularly impressive performance given its population of just 3 million. By our estimates, Utah is the least-populated state to rank as a major startup hub. Enterprise software is the dominant sector among sizably funded Utah companies. However, we also see a lot of non-SaaS business models pop up, in areas including fintech, audio devices and even peer-to-peer storage. The takeaway: It looks like emerging early-stage startup hubs don’t need to siphon talent from the largest tech ecosystems to thrive. California, New York and Boston don’t appear to be losing their dominance. But that isn’t stopping smaller startup hubs from thriving too. The data set looks at funding levels by state. In most states, the vast majority of venture activity is in a single metro area. Exceptions are California, with the San Francisco Bay Area, Los Angeles and San Diego, as well as Pennsylvania, with both Pittsburgh and Philadelphia. For rounds above $5 million, we limited the data set to startups founded after January 1, 2015. We did not compare 2018 seed funding totals to prior years due to the fact that a sizable portion of seed rounds are reported and recorded in the Crunchbase data set months after they close. As a result, reported figures for recent months undercount total funding activity.